Kids like to emulate their parents, so you can make brushing more fun by doing it together. Create a game like Simon Says or Monkey See Monkey Do, where your child can follow your brushing techniques. This has them focusing on the fun of the game rather than the task of brushing or flossing. Put a positive spin on the dentist and teeth brushing by reading fun books about the dentist or finding coloring pages about teeth. Your pediatric dentist has some great suggestions on materials that will shed a positive light on going to the dentist. Another fun game is to have your child name their teeth! It could be original names or names of friends or family, and the names can change every day. For some children, this helps their teeth become more familiar and encourages them to take better care of them. You can also involve your child in picking out their own dental tools. There are fun character themed tooth brushes, and tooth paste in tasty flavors that your child will enjoy. Letting them have a say in the type of tooth brush they choose, or the flavor of their tooth paste will motivate them to brush and floss at home. 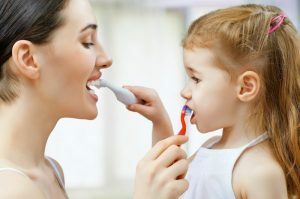 Electronic toothbrushes, such as the Kids Sonicare can also be very helpful and even have Bluetooth connected apps that the kids can use to play games and win virtual prizes for brushing. These toothbrushes also have automatic timers to ensure that your child is brushing for the full recommended two minutes, and have various settings based on your child’s sensitivity. Setting your child up for success in brushing and flossing their teeth early on is a gift you will give them for a lifetime. If they are resistant, keep pushing forward. You will eventually find what works for your child, and it will help them build good habits for the future. As your child grows into adolescence having good brushing habits will protect their teeth as they begin to learn to navigate the world by making their own food choices and developing eating habits that may not always be healthy at first. This continues on when they become college age and begin to live on their own. Your pediatric dentist is your partner and also an important resource for you in helping your child develop good oral hygiene and habits that will serve them in the future. Always feel free to contact your pediatric dentist when you have questions or concerns about your child’s oral health. Dr. James Forester is truly a kid at heart, which makes him the perfect option for your pediatric dentist. He strives to make every child feel safe, comfortable, and valued when they come to the dentist. He has the extensive skills and training to give your child the personalized dental care they deserve.